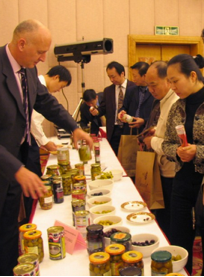 Sodercan, the Society for the Development of Cantabria used Gastronomic + 34 ‘s services in promoting agri-food program in Fuzhou (capital of Fujian). It was organized within the China Plan and supported by the ICEX and the Spanish Autonomous Communities, which collaborated with the Government of the People’s Republic of China and the Government of Fujian. We co-organized tastings, seminars, trade agendas, a showroom and two gastronomic dinners over the course of two days. More than 30 Spanish companies saw a boost in export of their products in China as a result of the Fujian distributors and importers in attendance.